Pretty small load this week. I didn't get anything in the mail. Click titles for plot synopses. At a Friends of the Library sale (one of the smaller branches of the Metro Public Library). This is a large hardcover book that would have cost $50 retail...I got it for 2 bucks! Woot! My boys love dinosaurs. From Camus to dinosaurs - very eclectic list! I have yet to read Camus, though I have been meaning to for years. Can't wait to hear what you think of The Plague. Ryan--I read The Stranger by Camus years ago and it stuck with me. Not really what it was about (it's been so long), but that it was well-written and I liked it. This one sounds really interesting! Alyce--The boys are thrilled with it! I couldn't believe what a find it was. Hope you have good luck when you go to your sale! Wow, lots of variety and intriguing titles and covers! 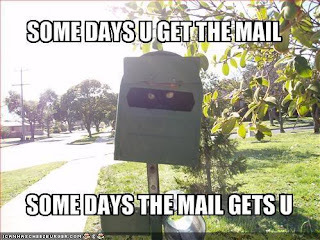 LOVE that mailbox photo/saying! enjoy all of the great books. I was feeling all down the past couple of weeks because I wasn't getting anything in the mail. Then I remembered that I haven't been asking for any books--I just can't until I get caught up. But I do miss those lovely packages!